I keep an Arca-Swiss style plate on any photo device (body or lens) that I own so I can quickly mount to a tripod as necessary.The Arca-Swiss style quick release clamps and brackets have been are the de-facto standard for photographers around the world for many years now. Their sucess is mainly due to it's simplicity and reliability. 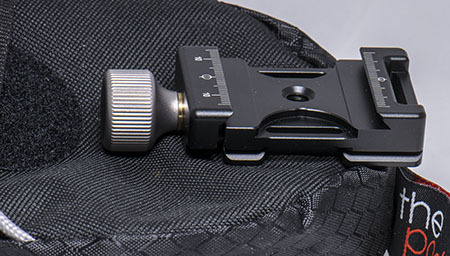 This shows an Arca Swiss bracket mounted to a camera. Note: the bracket is not included with this item. One of my favorite photo accessories I own is the Green Pod. But, one of the annoyances for me in using the green (or red) pod is that I had to remove the Arca-Swiss bracket from my camera in order to use the Pod. Well, a few years back, I purchased an Arca-Swiss style clamp with a 1/4 inch screw thread socket from a major supplier of these brackets. It cost me $60 back then! I recently lost that bracket, so I went looking for another. I found these wonderful brackets that were much nicer than my $60 bracket, for a fraction of the cost. This is what I use now on my Green Pod. Here's an image of the clamp showing the top and bottom views. Here's an image of the clamp on my Green Pod. 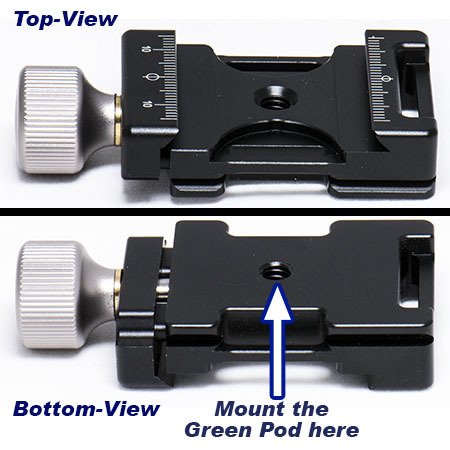 When I want to use the Green Pod, I just slip my camera onto the bracket, tighten the know and I'm ready to shoot. It's very fast and simple to do. This bracket is CNC precision machined and the surface receives an anode anti-oxidation treatment giving it a great finish. The body and washer is made of aluminium alloy and copper. It's compatible with all Arca-Swiss quick release plate, such as RRS / ARCA-SWISS / KIRK / Wimberley / MARKINS / SUNWAYFOTO / kangrinpoche / BENRO / SIRUI etc. You just slide the plate into the clamp, tighten the knob, and you're in business! You can buy brackets that are specially designed for your camera or lens from several manufacturers, or you can purchase the universal bracket that we sell here. This clamp measures 2.95 inches by 1.5 inches by .55 inches and it weighs a mere 2.3 ounces.